Hiking the Holy Land since 2007.
with the Jewish roots of their faith. Wonderful images and word pictures are laid out in the pages of Scripture. But they are contextualized by a culture, time and place that were much different from ours. The inspired writers of Scripture were eastern (Hebrew) in their thought and culture and they wrote to an eastern audience. Most western Christians are Greek thinkers. They see and contemplate the world much differently than easterners. Therefore, many of the rich images of Scripture puzzle western minds or escape them entirely. But if they can learn to think like a Hebrew, the pages of Scripture become unlocked and overflow with meaning. Using real life stories and metaphors based upon the Biblical text, the style of teaching is rabbinic. That is to say: the pilgrims follow their Rabbi, not only to learn what he is teaching, but who the Rabbi is and how he lives his life. The stories of Biblical history become clear as the pilgrim sees them in the context of the land and the people. Rabbinic teaching means the “Talmudim” (disciples) not only want to learn what their Rabbi knows but, more importantly, it is their ambition to become like their Rabbi. The physical rigour of Fifth Gospel ENCOUNTERS is complemented by relevant Bible teaching, second to none. Although a modern, air conditioned bus is used to travel throughout the country, this is not simply a bus tour. Pilgrims spend hours on desert paths and mountain trails, searching out springs, caves and ancient ruins, while following the routes and history of the migrating Israelites, the Kings and the Messiah. Bible teaching, relevant to the location, includes practical applications for today. A reasonable level of physical fitness is definitely recommended. 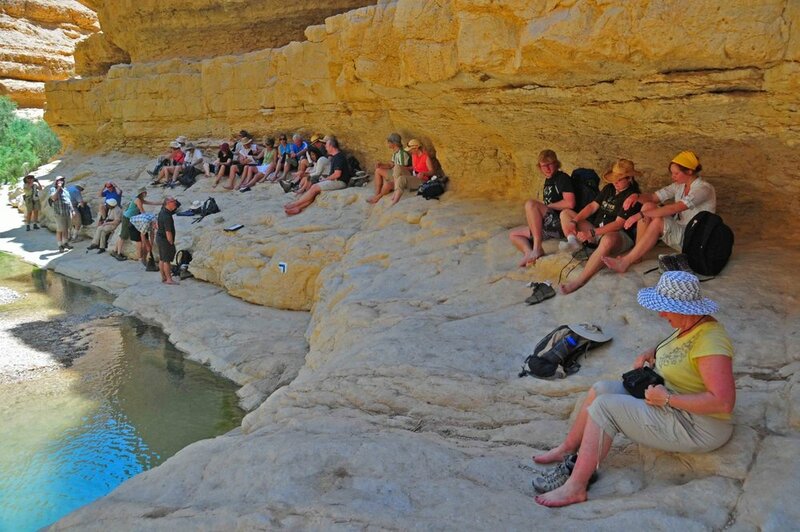 We are accompanied at all times by an experienced, professionally licensed Israeli tour guide who is there to ensure our safety and well being. This is a physically engaging walking tour. Before embarking on this expedition, you are advised to check with your doctor for any issues concerning heart, weight, osteoporosis, allergies and general physical conditioning. Everyday there is something new to see! The Text Came To Life!